I've had this outfit in my thoughts for months now (literally) and I finally decided to break it out however I'm definitely some what regretting that decision now. It was so unbelievably hot the day I wore this that I thought I was going to pass out from heat exhaustion wearing this jacket! Don't get me wrong, it was a nice and lightweight jacket... totally perfect for fall but not so perfect for outdoors in the sun when it's 96 degrees out with a heat index of 104! I absolutely love the dainty and feminine feel of the lace (and if I remember to take the jacket off for the picture the backless detail) paired with the rugged look of the military jacket. To keep the look completely casual I threw on a pair of leopard print sneakers which have recently been my go-to shoes for every outfit because they're just so darn cute! I love mixing flirty and feminine pieces with more tough and fun pieces to give it an entirely different look! 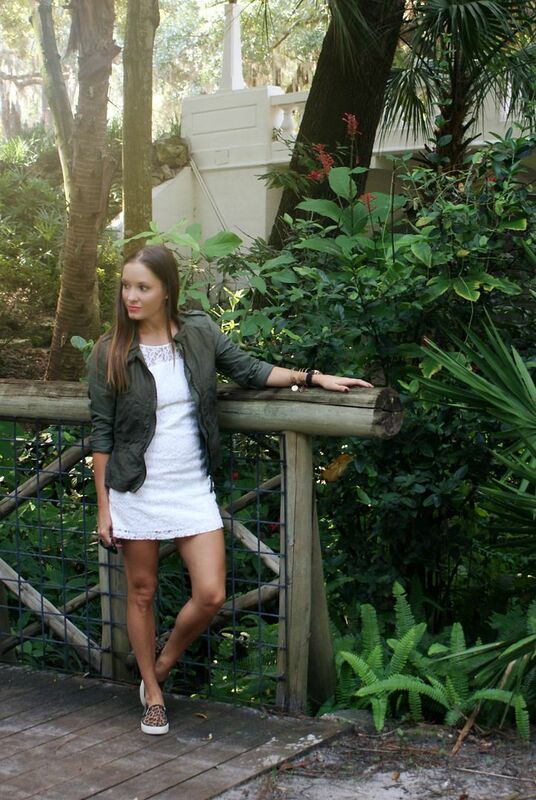 And I definitely feel like the military jacket is going to be a fall staple piece! Major shout out to my girl Jill over at The JJ Report for taking yesterday and today's pics for me and for doing my totally awesome braid from yesterday's (and spoiler alert, tomorrow's) post! You should totally check out her blog, she did her first fashion posts this week and I LOVE her style! i've got to get a jacket like that! I absolutely love this look!!! You look so pretty and I love the shoes that you paired it with!! Love this outfit, and am super impressed you made it through the photo shoot with that jacket on! I have a coat like that from F21 that I seriously wear on repeat the minute the weather dips below the 80's ;-) Your pictures are beautiful! I think you need to come and help me pose and style! So cute! Loving that jacket with the lace and how adorable are those slip ons?! love the lacy/girly dress with those cute sneakers!!! This whole outfit. You killed it lady! Loving the leopard shoes! I love toughening up super girly pieces and this look strikes the perfect balance. That olive jacket is so cute and I love those leopard print shoes! I love how you constantly mix tough and feminine pieces together! It is the best pairing and always looks so chic! Love that dress with the lace layover! Great price at Hollister too! I love that coat! The juxtaposition between cute and tough is great in this look! I want that dress! Those leopard slides are too cute!! Those shoes are officially on my swish list! The lace dress is beautiful! so cute!! a jacket like that is on my Fall wishlist! I agree with Darcy! I want one too. :) Love the combo of girly and edgy! That dress is so cute !! This outfit is flawless! I love it! Love this pairing! I would wear my military jacket every single day if I could :) I saw those same leopard loafers at Target and now I'm kicking myself for not buying them before they sold out! Absolute perfection! The leather, lace and leopard print is like literally my idea of a perfect outfit! Ohhh cute! I love military jackets with almost everything! So cute! Love the dress with the shoes and jacket. Great look! I love that you combined the feminine and rugged look! It's such a different look than a lot of us wear. Loving that jacket! Absolutely perfect look. xo! haha ohhh no, i hate when that happens! you decide to just go for an outfit and then it turns out the weather has plans to screw you over. it really is an adorable look- i love how all the elements are super different but yet blend together so well. who knew lace and leopard were amazing together?! I love your feminine Lace LWD. I wore a similar one to this with my Denim Jacket and Bronze Gladiator Sandals the other day, if you want to take a peek. =) Love the leopard slip-ons. I need a pair like those. Great styling, Pamela. Cute outfit. Love the lace dress!